When it was announced at the beginning of 2003 that there would be a Diocesan Celebration of the Year of the Rosary in October of that year, Bishop Robert Baker was asked by Fr. 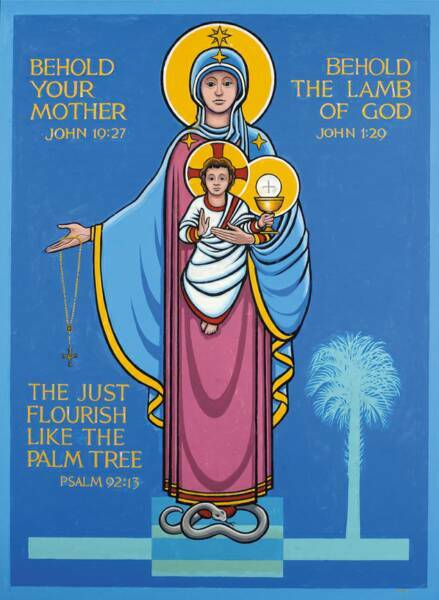 Stan Smolenski if the diocese could be entrusted/consecrated to Our Lady and if an icon of Our Lady of South Carolina could be commissioned for that occasion. The Bishop gave his permission. Fr. Smolenski sent a sketch to Fr. Larry Lossing of the diocese of Orlando, FL, an expert heraldry and church art. His experience includes art work for the film industry in Hollywood as well. Fr. 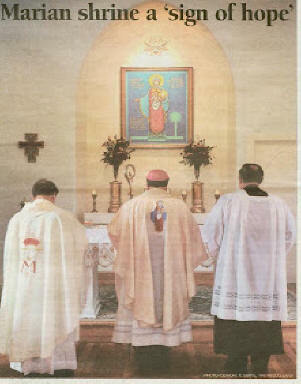 Lossing donated the icon which he brought to the celebration in Lexington, SC on 5 October 2003. The icon was kept at the St. Katherine Drexel Volunteer Residence on Wentworth St. in Charleston until it acquired its shrine in Kingstree. The leader of the first pilgrims expressed the sentiments of many of them so well: "I cannot go to Lourdes, Fatima or Medjugorje, but I can come to Our Lady of South Carolina, Our Lady of Joyful Hope.